Got a migration project coming up? We want to help. We deliver the fastest and most efficient anywhere-to-anywhere server migration solutions available. Let us help you create a data center migration plan that brings results—on time and on budget. Data center management has never been easy. Shrinking IT departments, strained budgets, new IT tools, and outsourcing of services to the cloud don't make your job any easier. Read on to learn how a server migration solution can help. Below is a set of white papers specifically for project managers and project architects who are leading large-scale data center migration or cloud migration projects. 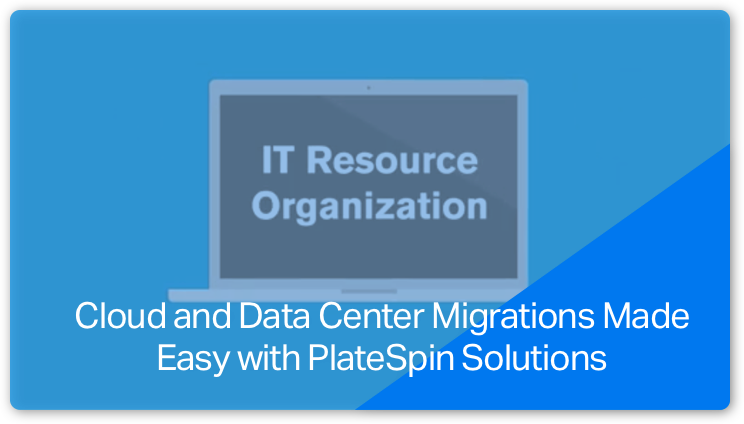 Learn how Micro Focus solutions like PlateSpin Transformation Manager and PlateSpin Migrate can help you plan and track large-scale data center transformation projects across physical, virtual, and cloud infrastructures. Learn why we are the IT pro's "go-to-solution" for large-scale migration projects. See a real example of how one company, Essent, saved millions by using PlateSpin®. By using PlateSpin Migrate, US Signal was able to automate the discovery of their customer’s network and server environment, which has reduced the migration preparation work by hours. Take a look at our short demo videos to see how easy it is to migrate Windows or Linux servers to the cloud. PlateSpin Migrate supports migrations to Microsoft Azure, Amazon Web Services, and VMware vCloud Director. Deliver cloud and data center migration solutions to meet your customers' most business-critical challenges today and tomorrow. Our partner program empowers and rewards partners who are delivering innovative solutions.